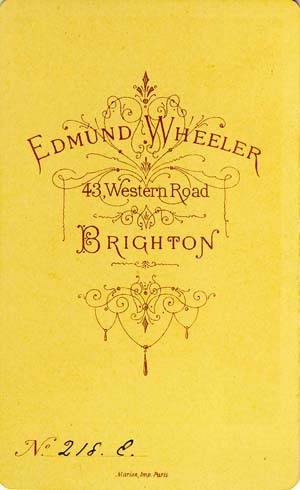 The photographer Edmund Wheeler junior (1836-1930) produced carte-de-visite portraits at his studio at 43 Western Road, Brighton, between 1870 and 1906. Cartes-de-visite were small photographic paper prints on card mounts the same size as conventional visiting cards (roughly 21/2 inches by 41/4 inches or 6.3 cm by 10.5 cm). This photographic format originated in France and so a small portrait mounted on card came to be known as a 'carte-de-visite', the French term for visiting card, although, in England, these small photographic portraits were occasionally referred to as "album portraits". Edmund Wheeler introduced a novel method of identifying the year a particular photograph was taken by adding a suffix to the negative number, which was customarily written in ink on the reverse of carte-de-visite portraits. Each letter of the alphabet represented a particular year of business. The letter "A" matched the year 1873, the letter "B" corresponded to the year 1874, and so on, until the letter "Z" was reached. After utilizing nearly all of the letters of the alphabet ("I" and "O" were excluded for obvious reasons), Wheeler would start again, but this time with a double letter "AA", "BB" , "CC" and so on. 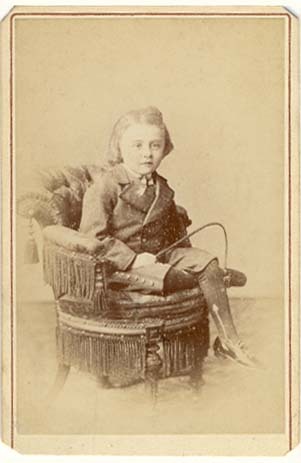 [ABOVE] Cyril Herbert Brass (aged 5), a carte-de-visite portrait produced by Edmund Wheeler of 43 Western Road, Brighton in May 1877. Cyril Herbert Brass, who was born on 7th January 1872, was the son of Alice Edith Shaw and Reverend John Brass (1839-1912), who had been the Curate of St Saviour's Church, Eastbourne. Photographed when he was 5 years of age, Cyril Herbert Brass was later to serve as an officer in Her Majesty's Militia. In 1895, Cyril Herbert Brass married Constance Marguerite Eglinton Whish. This union produced a son named Philip Hugh Gordon Brass (born 1896, Cuckfield, Sussex). At the time the 1901 census, twenty-nine year old Cyril Brass was residing in Kimpton, Hertfordshire and is described on the census return as a "Managing Director and Manager of a Brewery". Cyril Brass and his wife Constance divorced in 1908. Three years after his divorce, Cyril Brass and his 14 year old son were lodging at a boarding house near Bath, Somerset. On the 1911 census return, Cyril Herbert Brass describes himself as a "Brewer" and his marital status as "Single". Cyril Herbert Brass died at Soham, Cambridgeshire, on 13th September 1914, at the age of 42. 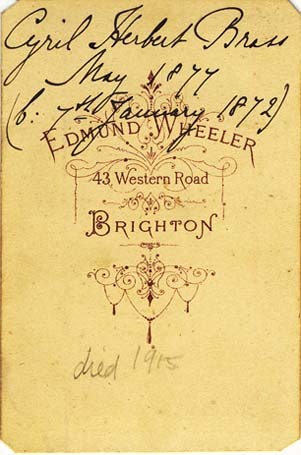 (A pencilled inscription on the back of the Wheeler carte-de-visite wrongly states that Cyril Brass died in 1915 - his death was recorded in 1914). [ABOVE] The inscription on the reverse of the carte-de-visite portrait illustrated on the left. 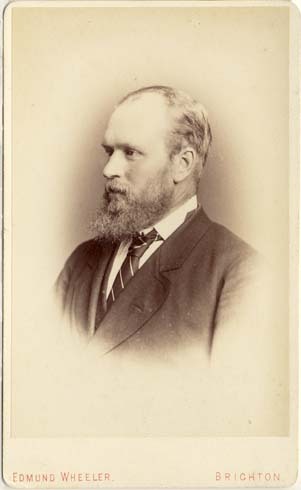 The caption, hand-written in black ink, reads: "Cyril Herbert Brass, May 1877 (b: 7th January 1872)". 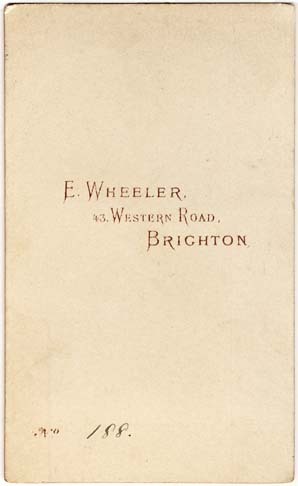 Normally, it is possible to estimate the date of a carte-de-visite produced at Edmund Wheeler's Brighton studio on the basis of the photographic negative number and the letter of the alphabet which had been added as a suffix. 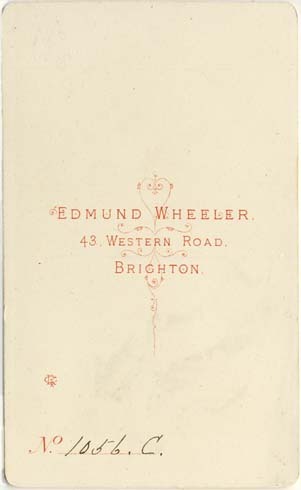 [ See the Edmund Wheeler Negative Code chart below and the selection of carte-de-visite portraits produced by Edmund Wheeler at his Brighton studio between 1870 and 1906 illustrated in the Portrait Gallery, below). 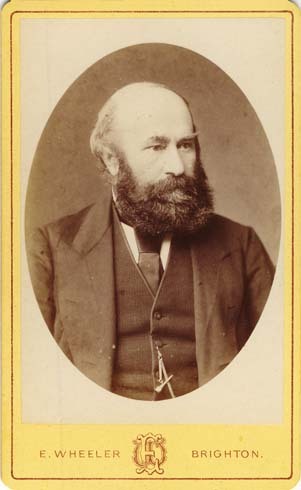 This particular carte-de-visite portrait of Cyril Herbert Brass does not carry a negative reference number. Although the carte-de-visite has been cropped to allow it to be slipped into a Victorian photograph album, it seems clear that the back of cdv did not have the usual printed area for the negative number ("No. ................"). 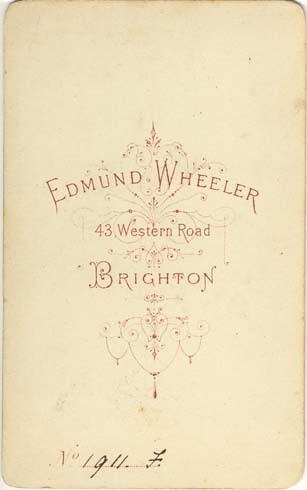 I think it is likely that the Brighton photographer Edmund Wheeler was asked to make several copies of the original carte-de-visite portrait which had been taken at Wheeler's studio at 43 Western Road, Brighton, in 1877. The fringed, posing-chair in the portrait of Cyril Brass also appears in a cabinet portrait by Edmund Wheeler which dates from the 1880s. 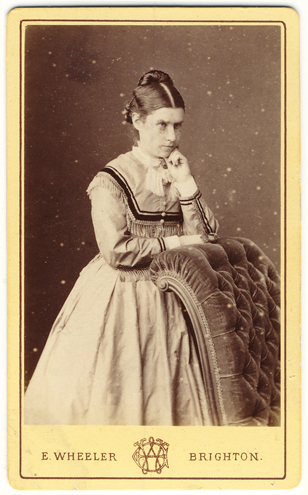 [ABOVE] A carte-de-visite portrait of a young woman leaning on chair, a photographic portrait taken by Edmund Wheeler of 43 Western Road, Brighton around 1870. Negative No. 188 (no letter suffix). Wheeler appears to have introduced a letter suffix to his negative numbers around 1873. [ABOVE] The reverse of the carte-de-visite portrait illustrated on the left, produced by the Brighton photographer Edmund Wheeler around 1870. 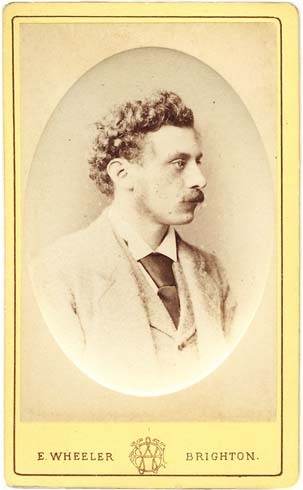 This photographic portrait was produced before Wheeler introduced a letter suffix to his negative numbers. 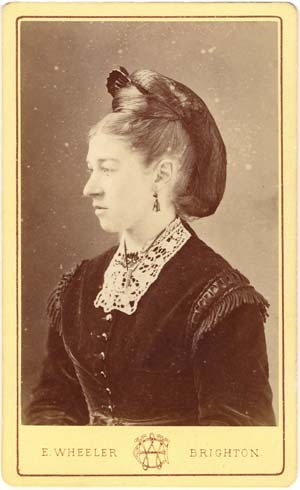 [ABOVE] A carte-de-visite portrait of an unknown woman produced in April 1873 by Edmund Wheeler of 43 Western Road, Brighton. Negative No. 386A. This photographic portrait was produced in the year that Wheeler introduced alphabetical suffixes to indicate the year of production. The letter suffix "A" indicates 1873. [ABOVE] The reverse of the carte-de-visite portrait illustrated on the left, produced by the Brighton photographer Edmund Wheeler. The carte helpfully provides a negative reference number together with the date of the portrait sitting. (8th April 1873). The notation "E. D. Ap8. '73" is inscribed in ink (top right corner). [ABOVE] A carte-de-visite portrait of a man identified as "Mr Mongredi", photographed around 1874 by Edmund Wheeler of 43 Western Road, Brighton. Negative No. 1000B. Although the gentleman's surname is unusual the subject has not been identified. [ABOVE] The reverse of the carte-de-visite portrait illustrated on the left, produced by the Brighton photographer Edmund Wheeler. The carte carries a negative reference number of "1000B" together with a pencilled inscription of "Mr Mongredi". [ABOVE] A carte-de-visite portrait of a bearded man, photographed around 1875 at the studio of Edmund Wheeler at 43 Western Road, Brighton. Negative No. 1056C. In the mid 1870s, the photographer began printing his full name - Edmund Wheeler - on his cartes. [ABOVE] The reverse of the carte-de-visite portrait illustrated on the left, produced by the Brighton photographer Edmund Wheeler of 43 Western Road, Brighton. Negative No.1056C. The trade plate is printed in red ink and is more elaborate than that of earlier cdvs. 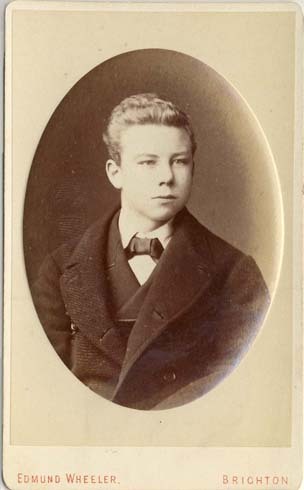 [ABOVE] A carte-de-visite portrait of a youth in his teens, photographed around 1876 by Edmund Wheeler of 43 Western Road, Brighton. Negative No. 117D. 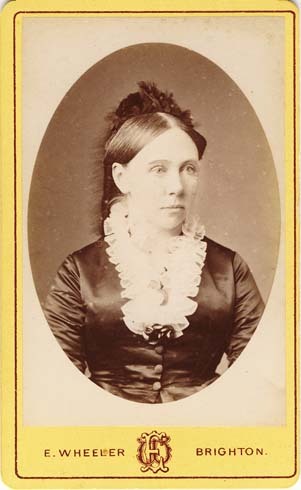 The photographic portrait is on a raised oval punched into the card. [ABOVE] A carte-de-visite portrait of a heavily bearded man, photographed around 1877 by Edmund Wheeler of 43 Western Road, Brighton. Negative No.218E. This portrait is a companion cdv to the portrait of the woman pictured on the right, presumably the man's wife. 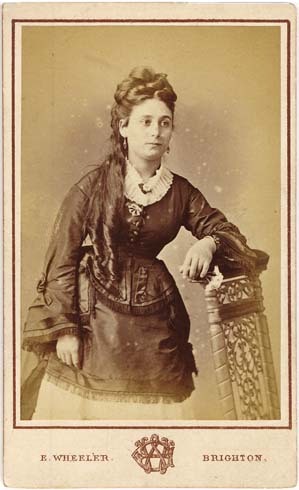 [ABOVE] A carte-de-visite portrait of a woman, photographed around 1877 by Edmund Wheeler of 43 Western Road, Brighton. Negative No.214E. This portrait is a companion cdv to the portrait of the man pictured on the left, presumably the woman's husband. [ABOVE] The reverse of the carte-de-visite portrait of the bearded man pictured in this row. Negative No.218E. 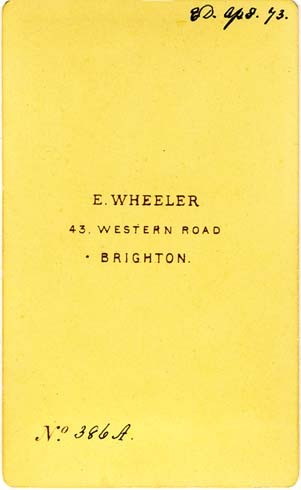 The trade plate which carries the photographer's details - Edmund Wheeler, 43 Western Road, Brighton - has been printed by Marion & Co. of Paris. (c1877). 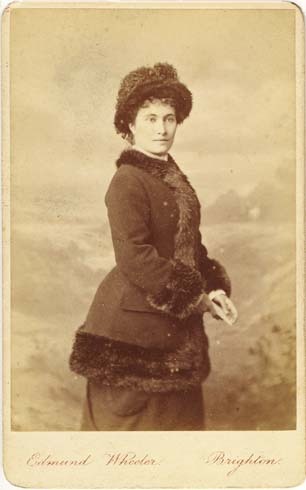 [ABOVE] A three-quarter length portrait of a woman in front of a painted backdrop, photographed around 1878 by Edmund Wheeler of 43 Western Road, Brighton. Negative No.1911F. [ABOVE] The reverse of the carte-de-visite portrait of the woman pictured on the left . Negative No 1911F. 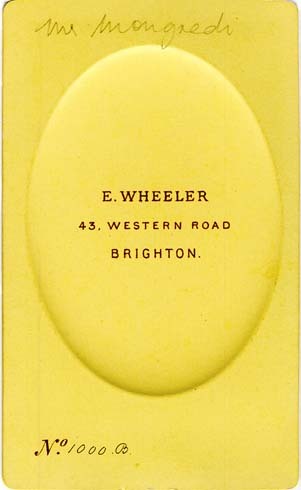 In this period Wheeler was employing cream coloured cards, with the trade plate printed in brown ink. 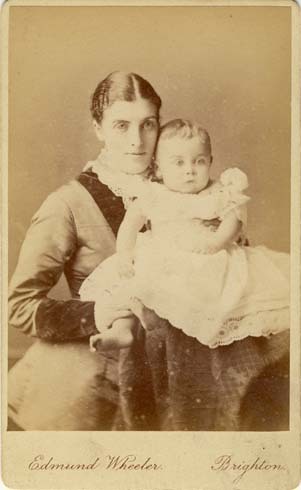 [ABOVE] A carte-de-visite portrait of a woman and her child, photographed around by Edmund Wheeler of 43 Western Road, Brighton. Negative No.2675G. This cdv carries a negative number in the same range and with the same letter prefix ("G") as the portrait dated 1880 (right). 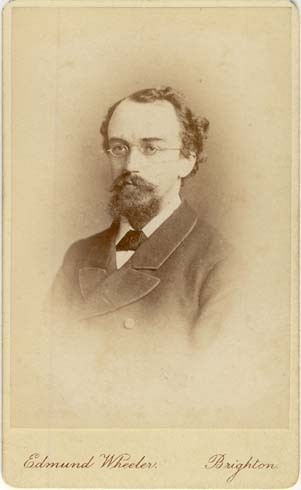 [ABOVE] A carte-de-visite portrait of a bearded man wearing spectacles, photographed in 1880 by Edmund Wheeler of 43 Western Road, Brighton. Negative No.2564G. The cdv is inscribed with the date the photograph was taken or sent "Sept.29.1880". A special thank you to Roger Vaughan, author of the informative website Victorian and Edwardian Photographs and owner of the Roger Vaughan Photograph Collection. Roger Vaughan was the first person to draw my attention to Edmund Wheeler's novel method of identifying the year a particular photograph was taken. Roger Vaughan noticed that Edmund Wheeler added a "letter suffix" to the negative number, with each letter of the alphabet representing a particular year of business. WEBSITE: Roger Vaughan's website Victorian and Edwardian Photographs - Roger Vaughan Photograph Collection (Roger Vaughan's article on Victorian Photograph Card Printers has been especially helpful).